Hey guys! At the end of last week's post I mentioned that I was going to the 2017 Michigan Writing Workshop, so today I wanted to do a quick update on how that went! To put it simply, it was extremely beneficial. The conference was at a very nice hotel in Novi, with five blocks of classes throughout the day and three classes during each block from which you could come or go as you pleased. It was a little overwhelming at first, but I very quickly realized the entire rhythm of the day was like going to classes on campus--something I am very familiar with. Plus, I wasn't alone. My cousin Cassidy (who is actually the one who told me about this conference in the first place) and I decided to pick the classes we wanted to attend the most and stay there rather than coming or going from all the available classes. In the end, the ones we attended were An Overview of Your Publishing Options Today, Everything You Need to Know About Agents, "Writers Got Talent", Talking Fantasy and Science Fiction, and finally, Revision and Self-Editing. I came away learning something from every single on of these classes. We heard some great tips from some really awesome agents and teachers--tips that I will definitely be sharing with you guys on this blog! I love learning new things, but I also love to go on and teach those new things I learn to others. And that's exactly what I plan to do over the next few weeks! This conference gave me a lot of great post ideas, and I'm excited to gather all my ideas together and share what I've learned with all of you. One of the biggest lessons that I was reminded of at this conference is how important it is to resist comparing yourself to other writers. When Cassidy and I first sat down, we quickly realized that we were used to communities of younger writers around our age. Because at this conference, young writers were definitely the minority. Out of the 100+ people there, maybe ten were early twenties and under. Maybe. Some of the people there had already been published or had an agent. One lady even had an eight-book deal! It was a little discouraging at first, especially because I knew the "Writers Got Talent" panel was coming up. For that class, participants had the opportunity to submit their first page to a line of six agents. The page would be read aloud in front of everyone in the room (granted, the identity of the author is completely anonymous) and then the agents would give honest feedback. With all of these experienced writers in the room, I felt like I was going to be ripped to shreds if my writing was read. (I say "if" because there was no guarantee that your first page would be read due to time constraints.) I thought that I was going to hear a bunch of really amazing writing and feel terrible about my own afterwards. Most of the writing that was read was surprisingly average. A few pieces were okay, and one in particular I'm still thinking about because it was so good, but overall? I was surprised! I thought that I was mediocrity in a sea of greatness, but in reality, there were writers of all levels at this conference. My piece didn't get read, but because I heard the agents critiquing other work, I was able to form an idea of what they might have said to me. And because every first page wasn't incredible, I felt a little more confident in my skills. Maybe I am meant to be a writer. Maybe my age doesn't matter. Maybe all of these people around me aren't as far ahead as I thought. Writing is an art. It takes passion, dedication, skill, time, and talent. Some writers can finish a book in a month. For others, it takes years. Some get published very fast, and some don't. Some can pitch out loud very well, and others just can't. In the end, comparing yourself just wastes time! Every person I came into contact with on Saturday was at a different stage in their writing journey. And very quickly, I found that to be really inspiring instead of discouraging. 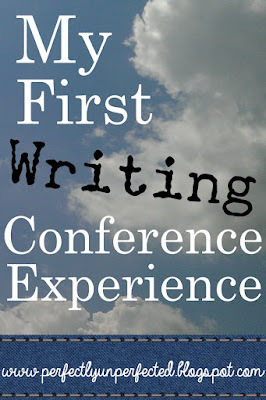 If you haven't attended a writing conference before, I definitely encourage you to do so! I was very hesitant to go simply because it can be difficult for me to push myself out of my comfort zone, but I am very glad that I went. It was definitely an experience that will help me with my future writing career, as well as my present challenge: editing!